Did you know that ATC services an area of over 4,000 square miles? As you can probably imagine, it takes a lot of equipment to build and maintain such a large, rural service area. From conduit and fiber, to end-user modems and routers, one man keeps track of it all. 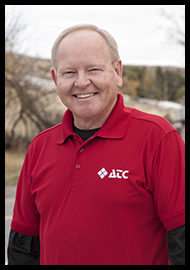 Introducing Rick Linard; ATC’s “Supply Supremo”. Rick has been with the company since 2009, and is based in our Albion office. While he enjoys tabulating inventory and cataloging invoices, he also loves golf, spaghetti and Crystal Lite lemonade. Rick even serves as a Pastor to his congregation at the local Christian Fellowship church on Sundays. We’re thankful to have this organized, detail-oriented individual, at the helm of our inventory needs!